Map of Africanized bee range in U.S. Note: A sidebar to this story reports how they count hundreds or thousands of bee stings on a bee victim, under the headline: 2,997 ... 2,998 ... 2,999. TUCSON, Ariz. - Twelve years into the killer bee invasion of the United States, Tip Tisdale steers his pickup truck into the driveway of a custom home in the desert outskirts of this desert city. It's a hot Monday morning in late April and this is the U.S. city where the invaders, also called Africanized bees, are most established. The bright yellow-and-black logo on Tisdale's truck, repeated on his T-shirt, identifies which side he's on - AAA Africanized Bee Removal. With the bravado that characterizes the men on the front lines, Tisdale walks toward the buzzing sound without protective gear, his face, arms and hands exposed. Pausing on the porch steps, he scouts the enemy: a loose cloud hovering under the porch roof overhang, composed of maybe 30 to 40 bees. Like the symbol for nuclear energy, electrons circling round and round, the bees occupy their air space and emit a feeling of contained energy that might explode any moment. I'm hanging back a few feet behind Tisdale, here to research how the bees are succeeding in the city, how people are adapting, and why the great national media machine has forgotten this once-sensational topic. Knowing that killer bees can take up residence in any nook or cranny of civilization - in the eaves of buildings, in the cushions of sofas and chairs left outside, under storage sheds, in cardboard boxes, flower pots, light fixtures, old tires, utility boxes, bird houses, culverts, woodpiles, trash cans, towers and windmills, even in vehicles, including airplanes - I'm ready to run. In a half whisper, trying not to trigger the bees, Tisdale explains what we're seeing. These must be foragers for a colony that's hidden inside the wall of the house. He points out that some are crawling into a hole gnawed through the wall. Inside the wall there must be a lot more bees carrying out a range of duties, and a queen. If the colony is only a week or two old, there are maybe 10,000 bees in the wall; if the colony is several months old, there could be 30,000. "The foragers are bringing water in - see?" Tisdale says. Squinting, concentrating on the tiny moving shapes, I can make out water droplets on the bees' legs. If they were foraging for pollen, they'd have yellow sacks of it bulging on their legs. The water helps them survive the drought that has withered the desert for months; they haul the droplets from swimming pools, hot tubs and landscaping irrigation in this upscale neighborhood. They bring the water inside the wall and use their wings to fan and evaporate it, to keep the colony cooler than it would be otherwise. The insulation in the wall also helps. "They like houses, because people provide cooling in the summer and heating in the winter," Tisdale says. "They are a tremendously intelligent animal." He glances around, alert for any patrol bees that might be coming at us. Fully established colonies have storehouses of honey and brood to defend, and it begins with a perimeter of patrol bees. "The patrol bees look for trouble," he says. "They'll buzz in your face. If you don't react right or if they get a signal from you they don't like, they tag you." Meaning, they sting you. He advises that we'd better stand still and hold our breath if any patrol bees check us out, because one thing the bees really don't like is any mammal's breath - mammals are predators who might be after the honey. We're lumped in with badgers, skunks and bears. Above all, we'd better not swat a patrol bee or even try to brush one off. Just one sting or one smashed or ticked-off patrol bee would send a chemical pheromone signal to the rest of the colony, and in a split second the next level of defense, many thousands of guard bees, would come streaming out. "Every female with a venom sack would dump on you," Tisdale says. So far, it's a Western thing. Since the bees invaded from Mexico, they've stung four people to death in Arizona (including one who was allergic to bee stings). As many as eight more people have been killed in New Mexico, Southern California and Texas. There is disagreement about how many deaths the killer bees can be blamed for: Do we count the bulldozer driver in Texas who jumped off to run from bees and got run over by his own machine? As the bees continue to spread, several thousand people as far north as Las Vegas have been stung, many of them hundreds of times each, without dying. Tisdale, a lanky 53-year-old who has worked the front lines about five years, has been stung too many times to count, at times so severely that his arms swelled up painfully or his eyelids swelled shut for days. At this house, where a family inside has called for help, only a few patrol bees come forward to check us. Tisdale says it indicates this colony has only been here a short time and doesn't yet have much stored up to defend. Even so, before proceeding any closer, it's time for us to suit up - thick cotton coveralls, canvas gloves to the elbows, pith helmets draped with hoods that seal to the coveralls, and strategically applied strips of duct tape. Getting down to business, Tisdale closes in with spraycans of professional grade pesticides. He whacks down the bees we can see, climbs a ladder so he can spray into the hole, uses a prybar to widen the opening, keeps spraying. Alarmed bees pitter-patter against us, trying to sting us through our gear, but it is not the folklore classic killer bee explosion. In a few minutes the whole colony falls silent and still, and Tisdale presents the customers with the bill: $235. The Triple-A dispatcher relays another call for help and we drive to another neighborhood, where there is another kind of problem - a swarm. Thirty times a year or so, a killer bee colony divides: Some of the bees swarm away with the queen looking to colonize new territory and the rest stay put and raise a new queen. It is a way they maximize their territory. We find the swarm in the backyard, clinging to a tree branch. It's a writhing, solid mass of maybe 12,000 bees surrounding the migrant queen. The swarm is resting on the branch. Tisdale and Paul Gerard, another Triple-A pro who rolls in, discover that the swarm has just split from a big colony under a storage shed. We suit up again and the pros attack the swarm in the tree and then the colony under the shed. They use a smokepot to slow the bees, a soapy spray that clings to the bees and clogs their breathing, and the pesticides. Ripping up the floor of the shed to expose the colony, they find the eerily beautiful fins of honeycomb, pupae in the wax cells, and the emergent queen. It's sweaty work in the thick protective gear, staving off the bees' defense. Thousands of dead little bee bodies curl on the ground. But it only takes about an hour and half to do this job and present the bill: $600. Tisdale's cell phone keeps jingling. On an average day, he estimates, he does six service calls; on a busy day, he averages 10 to 15. Triple-A's going rate is roughly $200 per hour per man on the jobs I observe, split between those on the front and the head of the company, who does the dispatching. Triple-A is probably the biggest anti-killer-bee company in the world, with five pros in Tucson and eight in the Phoenix metro area, a statewide toll-free number and 24-hour-a-day dispatching. Even the company's name is a marketing ploy - AAA to be first in the Yellow Pages when customers under siege are looking for bee removal in a hurry. I'm beginning to see that this is a story not only of ecology, but also of the good old resilient American instinct to make a buck out of anything that presents itself. It wasn't supposed to turn out like this. And you could say that several times over. When 26 bee colonies from Africa were brought to Brazil by a scientist in 1956, it was an attempt to boost that country's honey production, not to start other industries. But a year later, African queens escaped captivity and began spreading like crazy on their own, taking over regular honeybee colonies either by force or interbreeding and asserting dominant genes, and occupying many niches held by native bees. Soon, Hollywood was churning out cheap horror movies like The Swarm and Deadly Invasion: The Killer Bee Nightmare. The front shifted from country to country as the Africanized bees picked up speed and killed an estimated 1,000 people in Latin America. They invaded Texas in 1990, Arizona and New Mexico in 1993, California in 1994, Nevada in 1998. Today the invasion threatens to cross the Arizona/Utah border, and has reached San Diego, Los Angeles and Houston. "I think they are all the way upriver (along the Rio Grande to the Albuquerque area)," says Carol Sutherland, New Mexico state entomologist. "There's a lot of wild country (in central New Mexico) where people just haven't run into them yet." Sketching a few of Arizona's spectacular incidents: An 88-year-old woman was found lying in the street in Apache Junction in October 1995, stung more than 1,000 times; she died. The same month, a 67-year-old man in Carefree was reading a newspaper on his porch when bees attacked him; he jumped into a swimming pool but they kept stinging him every time he came up for air; he also died. A 72-year-old man whose head was covered with bees pounded on the screen door of a neighbor's house in Eloy in 1997, shouting, "Help me! Help me!" A woman inside put on her wedding veil as protection and grabbed a garden hose to try to spray the bees off the victim, but he also died. In Tucson, many dozens of dogs have been stung to death, ones that were leashed or penned in yards and couldn't escape bee explosions. Horses, chickens, pet geese, ostriches, pigeons, and at least one duck have been killed. Victims of nonfatal attacks include a golf pro and caddie during a tournament, and a man in a wheelchair who got stung about 500 times on his head. "You feel burning, you feel hurting, and you're gasping for air," says William Anderson, describing how it felt when he ran into killer bees last summer at his house south of Tucson. As he carried groceries from his car, he felt one sting on the back of his head. He smashed that bee, and it set off thousands more that pursued him in and out of his garage and around his front and back yards. "I just kept swatting and swatting at them, and it seemed the more I swatted, the more they came," says Anderson, who was 64 at the time. "I was yelling and screaming, covered head to toe with bees. They were going in my mouth and I was spitting them out again." Police and a passing fireman finally got Anderson away from the bees and to a hospital, where medical staff "cleaned me up and counted roughly 800 stings, maybe more," he says. "I had stingers all over my eyelids, my tongue, face, neck, arms. They dug two bees out of my left ear and one out of my right ear." Researchers try to measure exactly how these bees are different from the other 20,000 species of bees in the world, and especially how they're different from regular honeybees, which were first brought to this hemisphere from Europe more than 400 years ago, and are easier to get along with. Our European bees are the same species (Apis mellifera as the African bees and have nearly identical shape, size, coloring and diet. The differences are mostly in behavior. European bees are relatively slow and steady, because they evolved in a cold climate, holing up in permanent colonies, with few predators. African bees evolved in the superheated tropics, foraging year round, more on the move and facing a much wider array of predators. They reproduce far more quickly, and throw off 10 times more swarms. Each established colony deploys five times as many guard bees, and attacks three to 20 times faster when provoked. They're like regular bees on methamphetamine. Instead of just landing and stinging, as a regular bee does, a killer bee zooms at you full speed, with its stinger aimed forward, and hits with a noticeable pop, driving the stinger deep. Even though the venom isn't more potent, due to the number of stings, it's often delivered in massive amounts. Tucson is a treasure chest of such information, because fate had already dealt it the Carl Hayden Bee Research Center, run by the U.S. Department of Agriculture. Logically, the lab has become a world leader in killer bee research. Staffers have perfected useful tools such as the "temper tester" - a target you strap to your pith helmet to count stings per second - and they've analyzed how the venom acts. It acts like cobra venom, explains the lab's venom expert, Justin Schmidt, and "it generally raises real havoc." Aside from the ouch, the venom attacks nerves and blood cells, flooding your bloodstream with crud. If you get enough of it, it stops your heartbeat. It can also cause intravascular coagulopathy: "Your blood suddenly starts coagulating, forming clots, and all your organs die at once," Schmidt says. "It's not a pleasant thing." But when the victims merely suffer several hundred stings, the main medical problem, Schmidt says, is to re-establish the victim's "mental equilibrium." It's been predicted that killer bees will eventually spread through much of the temperate habitat in the nation, including up the West Coast to Portland and Seattle. Their advance has slowed as they invade temperate areas and there is now disagreement about how far they'll get and what condition they'll be in, but Tucson is a model for what to expect. The bees take to the city because people have created a jungle on the desert: The irrigation and landscaping create blooms year round, providing nectar and pollen, and there are many other sugar supplies - spilled Coke, ice cream, candy wrappers in trash cans * that are even easier to tap. All the buildings, infrastructure and junk piles provide crannies that can be occupied. This is the city where a killer bee colony built 300 pounds of honeycomb in the wall of the Delta Gamma sorority house. In an average square mile of Tucson, the pros estimate, there are as many as 12 killer bee colonies, plus swarms on the move. People began to adapt as soon as the bees hit town. A local woman, Cassandra Garber, started producing killer bee T-shirts for sale through the Audubon Nature Shop. And a local fire department, Northwest Fire, perfected a method now used around the West. When people in a bee explosion manage to call 911, firefighters (wearing bee hoods and possibly duct tape) roll in and spray firefighting foam - having discovered that the foam clings to the bees, knocks them down and suffocates them. Fire departments can't hit the sirens every time a bee is sighted, though, so they've decided to respond only to actual or imminent explosions, such as a swarm at a daycare center. The government can't begin to handle all the killer bees - and that leaves a huge opening for private-sector entrepreneurs. Most bee control used to be done for free, by beekeepers who wanted to collect any stray European bees. Today the Tucson Yellow Pages has a Bee Removal heading, listing 31 companies. The leading companies aren't general pest controllers who expanded to do bees; they specialize in killer bees. At the top of the killer bee industry there's an edgy competition rich with irony. The top two companies are both run by bee scientists who morphed into businessmen: Tom Martin at AAA Africanized Bee Removal, and Steve Thoenes at BeeMaster. They're both hustling. This spring, Martin took a film documentary crew from New Zealand into the Arizona desert to see what he said was the world's largest killer bee colony; Thoenes hosted a BBC crew from England, gathering killer bees in a glass case so the crew could film a colony under construction. But the two men work with completely different mindsets. They're a study in human variability. Martin, who has a master's degree in entomology, runs the biggest color ad in the Tucson Yellow Pages category, and an even more prominent Triple-A ad on the glossy binding of the Yellow Pages, and the same package in Phoenix and the directories for Phoenix suburbs. He also drums up free publicity, working with local TV news and local papers whenever Triple-A is handling a notable bee problem, constantly raising the alarm about how bad killer bees are. "It's real important that the general public get warned appropriately enough that we don't get any more people killed," Martin says. "This is an emergency response business, not pest control. That's what drives me, why I work 16 hours a day, seven days a week." Probably to compensate some for the ad budget, Martin bases his company in his home office, yet even there he's tightly wound, juggling calls on four phone lines. When I ask about Triple-A's rates of $200 an hour or more - high considering there is no government safety net for people who can't afford professional bee removal - he answers, "People who say, 'I don't want to spend the money or I can't spend the money, what can we do?' There is nothing they can do." Thoenes, who has a Ph.D., is more laid back. At his 40th birthday party a couple of years ago, he served stingers. He has BeeMaster's headquarters hidden in a generic strip mall, with no sign on the door, and freely explains the low profile * if anyone in the area gets stung, they might blame a bee business. His mother, Ann, and another sweet, gray-haired lady, Elouise, answer the phones. But despite appearances, BeeMaster is a world center for a full range of killer bee services. 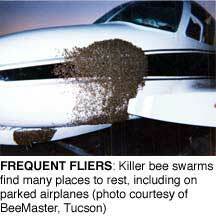 In BeeMaster's first year of operation, 1994, the company carried out 397 killer bee removals in the Tucson area. Last year, the company did about 4,500. Thoenes estimates that altogether the local companies handled 15,000 to 20,000 bee removal calls last year. "So it's a $3 million to $4 million industry in Tucson alone," he says. Collaborating with researcher Schmidt, Thoenes is also breaking the bees' communication codes - analyzing the complex mixtures of pheromones bees emit for many purposes. Scout bees fly ahead of a swarm, for example, marking places to colonize, and Thoenes has concocted a mixture that mimics what the scout bees put out. He applies the mixtures to other inventions - killer bee glue boards and "swarm traps," which are cardboard pots with little entrance holes, just right for a killer bee colony. If you're worried that killer bees will invade your property, which includes the worry that people might get stung and file lawsuits (a spinoff industry), you can hire BeeMaster to hang swarm traps and glue boards in your trees. Then any swarm that comes along will likely end up in a trap, and any scout bee will likely end up on a glue board. "Eliminate the scout bees, you eliminate the information gatherer," Thoenes says. On a wall map of the metro area, colored pins identify the clients of his protection service: country clubs and golf courses, apartment complexes, corporate campuses, airports, museums and a zoo, swimming pools and ritzy subdivisions. BeeMaster checks the swarm traps once a week or so and cleans out any bees trying to make a colony. Sample rates: $25 a month to establish a perimeter around your house, $150-$250 a month for an apartment complex, up to $1,500 a month for a large industrial complex. "It's a full-service system," Thoenes says. "There's really nobody else who does what we do." His swarm traps even hang around Disneyland, he says; he sells them in bulk around the Southwest and trains people to use them. He has seven employees and says he's ramping up, having just won a contract to do killer bee protection at more than 1,000 public schools around Arizona. Yet Thoenes is also reflective about the business. He laments how some people are "trying to shock the public to get higher prices." For a basic bee removal, he charges about $100 - less than many of the other companies. Over the years he's been on NBC Nightly News, Hard Copy, Discovery Channel, and in U.S. News and World Report, but these days he rarely seeks publicity. "If my clients call me, they know they'll never be in the newspaper. That's part of the arrangement." Asked if he's hurting his profits and training new competitors, Thoenes shrugs and says, "The bees are everywhere." He's got job security without the sensationalism. "If I wanted to, I could scare the wits out of anybody. But we can solve it through education and simple technology." Killer bees have tuned up the city. They're a force for urban renewal. People not only tread more carefully, they're a whole lot more vigilant about caulking their eaves, getting rid of old porch furniture and decrepit sheds and vehicles that don't run - reducing anything the bees might colonize. Yet the bees are also affected by the people. As all the bee removers relentlessly kill the most ferocious and most obvious colonies and swarms, they subject the bees to tremendous evolutionary pressure. "The Africanized bees in Tucson now are nothing like six or seven years ago," Thoenes says. 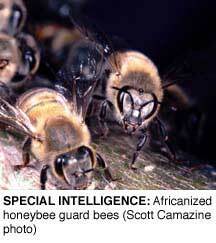 "They're not nearly as mean, and they're much more cryptic," hiding better and not provoking the bee removers. The pattern seems to be, when the killer bees invade a place, the first waves display the hottest temperament. Most of the human fatalities happen in the first years, then the people and the bees adapt. "This thing is blown entirely out of proportion," says Schmidt. "We're not afraid of cars, nicotine, alcohol" - all of which kill far more people - "but we see a bee and all of a sudden, we're running around flapping our arms. It's innate in our genetics. We're afraid of things that would attack us." Of course, Martin and other competitors don't agree that the bees have cooled down at all, and no one says killer bees have cooled off so much they're no danger. A few days after my visit to Tucson, five dogs penned in a yard got stung to death when a colony under a storage shed exploded. The cloud of bees was "20 feet wide and 60 feet long, they could hardly fly; they'd run into each other," says Ernest Kesterson, Sr., whose family battled the bees. "There was nowhere you could turn without getting into a mess of them." There are other angles. Killer bees have made the crisis in native pollinators even worse, by competing with native bees, bats, moths and other dwindling pollinators. They're a hassle for the beekeeping industry, making it harder to produce honey for market, harder to pollinate crops, and harder to find places to locate the hives where people won't rebel. Leonard Hines, who keeps 500 hives southeast of the city, says, "Here in southern Arizona, the chances are, every hive is Africanized to some degree." Beekeepers, agriculture, the honey industry, as well as tourism and economic-development interests wish to downplay the dangers. Bee removers work the roofs of Las Vegas casinos and hardly ever make the news. It's hard to find anyone official calling the killer bees by that wonderful name anymore - now they're mostly called Africanized honeybees, or just AHBs. The science effort is dwindling, with the Tucson lab down to three researchers (from a high of eight) and a threat that the Bush administration will close it and two other federal bee labs to save money. But the relationship of the killer bees to the bee removers captures me. There is a sadness to it. Really, the killer bees are just trying to defend themselves. Every bee that reacts to a predator dies, once it delivers the sting. 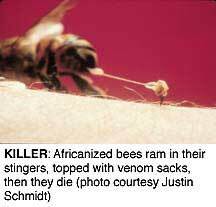 Call a pro, by all means, but once they roll in, it isn't hard to kill a killer bee. The people who specialize, rattling around in their trucks loaded with ladders, prybars, saws, drills, and the chemicals and soapy sprays that do in killer bees with only a few wisps, understand. They deal with a creature they respect and sympathize with. "When I was a kid (with a few hives), everyone saw honeybees as beneficial, a positive thing," Thoenes says. "Now they're seen as something to be killed as fast as possible." Kent Griffith, a brawny, affable cancer survivor who is BeeMaster's point man in the field, mostly works in a T-shirt, gets stung maybe 100 to 150 times a day, and says you get used to it. It's as if he wants to give the bees a chance to leave their mark on him. Or, as if the bees help him feel alive after the cancer. After all, there are people who believe in the medicinal properties of bee stings. One day he demonstrates it to me - snatching a lone bee out of the air with his bare hand and rubbing it on his forearm, so the stinger tears out of the bee and lodges in his flesh. I can see the tiny venom sack still attached to the stinger, still pulsing venom into him. As his flesh swells, it draws the stinger in deeper. "Still going," Griffith says. "I've timed it at over 10 minutes on numerous occasions." Different bees, different colonies, have different mixes in the venom, some hotter than others. "Wow!" Griffith says. "That has some zing." Another sunny day, I go into the desert on the city's booming northwest side with Griffith, working a major contract that BeeMaster has with a developer - a thousand acres of cactus and cliffs in the beginning stages of being converted to multimillion-dollar homes. The planned roads have been staked out, and before the dozer drivers venture in, the killer bee colonies must be removed. Griffith has hiked all over the rugged land, probing crevices, burrow holes and cavities in the cactus, locating colonies. "It's unbelievable, the population density," he says. "There are colonies that haven't been disturbed for years." These bees have plenty of honey and brood to defend, and they're direct descendants of the "leading edge" killer bees, he says. He got into a colony in a cliff a few days ago that was "spectacular." He got stung 300 times within seconds as he "nuked" it, he says. "At least I killed them with reverence." Today we're checking the same colony, because Griffith has spotted more bee activity with his binoculars. It could be that the queen survived, and the colony is rebuilding. Apparently defying OSHA as well as death, Griffith props a ladder on a slanted boulder and climbs nearly straight up the cliff, 30 feet to the crevice, no rope belay. The bees are safe from everything but us. I climb as high as I can on the boulders nearby, so I can do my job of taking photos. I hope for an explosion, but it's a little disappointing. The colony's defenses have been depleted. As Griffith stretches impossibly from the top of the ladder to reach into the crevice, he gets stung only a couple of dozen times. The crevice amplifies the buzzing of the alarmed bees as they cringe deeper into the honeycomb that is no refuge. We brought the killer bees from Africa for our purposes and the truth is, honey production in Brazil has soared, just as the importer hoped, and the bees have not escaped our grasp. As Griffith finishes off the few thousand that are left in this place, several fly out far enough to pop against me. I watch one stinging my black leather camera strap with its incredible determination (many predators have dark fur) and listen to its high-pitched song, until it gives up the stinger and falls into the dirt. Shortly, we get a call about a swarm in a tree in a Target store's parking lot. Off we go. 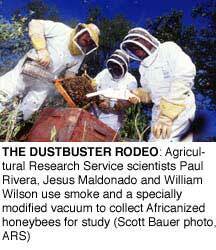 Justin Schmidt, Carl Hayden Bee Research Center, in Tucson, 520/670-6380, ext. 109. On the Web, numerous sites have killer bee information, including www.stingshield.com, agnews.tamu.edu/bees and bees.ucr.edu.